a bite from an apple. I have been thinking of you so strongly, missing your Shabda filled inspirations! So happy to hear from you this morning. Leslie, dear, thank you for another lovely metaphor that paints a picture, which brings the Works to life with depth and majesty. It was a grand experience for you to see the eclipse. I only watched it on TV, but was amazed at the amount of emotion it evoked. You captured it here beautifully, even encompassing a higher viewpoint and something more to contemplate. Very nicely done! And good work, Amalesh! The photograph is amazing! Beautiful reflection of the Inner process. Being present in the process, patience, trust, surrender and acceptance of the Gift! Thank you for your kind comments. 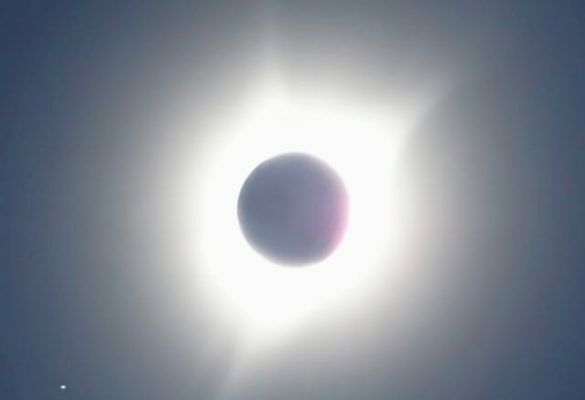 The eclipse was such a lovely experience, offering much to contemplate. Every day I’m more and more grateful for the richness of the journey.